The week is encouraging everyone to be ‘Bike Smart’, so if you travel to work on a bike during Road Safety Week, stop to take a safe selfie and be in with a chance to win some cycling goodies. If you send your selfie with your name to community.safety@blackburn.gov.uk, you will receive a free hi-vis neck warmer. 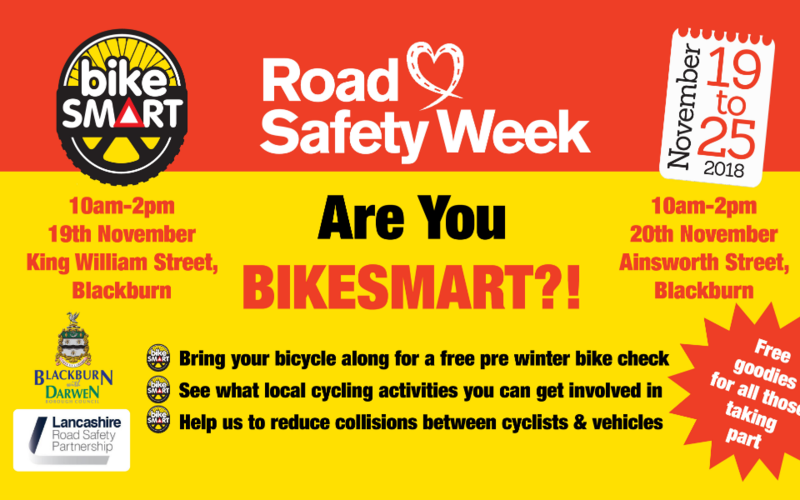 There will also be free winter bike checks on Monday 19 November 19th, outside Blackburn Town Hall between 10am and 2pm, and on Tuesday 20 November on Ainsworth Street, Blackburn. Safety advice for cyclists and drivers will be available at these sessions. Drivers play an important part in cyclists’ safety – as a ‘Bike Smart’ driver, here are a few simple steps you can take to make roads safer for people on bicycles and motorbikes. Take time to look properly before you pull out at junctions – turn your head to look, don’t just rely on a sideway glance. Leave plenty of room when overtaking or passing bikes – when passing a bike leave at least 150cm between you and the rider. Slow down on rural roads – slowing down will help you to take sharp bends more safely and you will be more likely to spot riders in front of you. Drive slowly in places where people live – driving more slowly will give you more time to spot danger and more time to react. Avoid car dooring by using the Dutch reach to check for bikes – instead of using the hand nearest the door to open it, reach across with your opposite hand. This forces you to turn your head so you can check for bikes before you open the door.